This is one of my ready-to-use ESL proficiency reading lessons complete with teacher's and students' notes, that is based on an article published in the THE WEEK about teenagers who find shelter at night by riding the London Night Buses. Why are these children seeking shelter? What are their lifestyles like? Why doesn't the city do anything to help these kids? These are just some of the questions that are answered in this interesting excerpt of investigative journalism into a sub-culture that exists in large cities in the western world. This ESL proficiency reading lesson is at a very high level and is suitable for advanced and proficiency level students (C1 and C2). Please note that this article also has swearing (when the teenagers are quoted), so it is not suitable for children or anyone that might be offended. 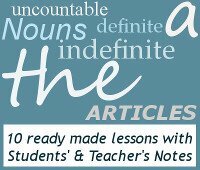 This lesson starts with a short dicussion warmer that is followed on by vocabulary exercises. There are ready-to-cut-out flashcards with words from the text. The students need to match words and synonyms, as well as words with definitions. There is a reading comprehension exercise with the answer key provided for the teacher. After the reading activity there are tile puzzles for the students to complete, so that they can work out some of the idioms and phrases that appear in the text. Of course there are also proposed activities for the students to practise using their new vocabulary and idioms. The lesson concludes with a discussion and an opportunity for the students to practise using 'could' and 'should'. For homework the students can read through the text again and pick out any vocabulary words they don't understand. Due to the level of this particular article, the students won't be in short supply.